A staple in the human diet for thousands of years, corn is also a high-quality food for many types of livestock. This extremely healthy grain is a great source of vitamin A, several B vitamins and antioxidants. In addition, corn contains a variety of minerals like magnesium and phosphorus. Also, it is a good source of fiber and protein. First of all, F.Garcia’s yellow corn products and feed begin with quality agriculture. Our products originate from corn farmers and processors in the United States’ Corn Belt. This region produces 40% of the world’s corn crop. Suppliers in Missouri, Illinois and Indiana grow and process our yellow corn products. Consequently, F.Garcia offers only the best American-grown corn and feed to our family of customers. We also offer one of the cleanest corn products in the industry. Our products have very little dust and a bright color. Most of our yellow corn products are destined for the domestic food service industry. Many are used for snack applications. 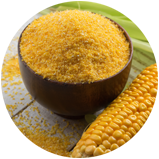 Within our family of corn products, we offer Yellow Coarse Grit, Yellow Snack Meal and Yellow Corn Cones. Each corn product has its own ideal use for a variety of applications. Visit our Yellow Corn Products page to learn more about each of these products. In addition to our domestic customers, F.Garcia has numerous international customers around the world. 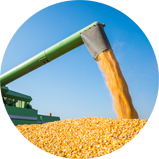 We export containers of bagged yellow corn products and bagged corn feed products. Finally, as a family company operating for over 40 years, we believe that quality agriculture means good food. Join our worldwide family of customers and receive quality corn ingredients from F.Garcia, one of the leading yellow corn suppliers in the United States.